Paris is suffering a huge drop in tourism following the deadly attacks two weeks ago. The number of tourists who canceled their trips to Paris in the week following the attacks jumped up 21% compared to cancellations during the same week last year. New bookings dropped by 27%, data from travel data company ForwardKeys showed. Bookings for Christmas are down 13% compared to the same period last year. One of the terrorists who killed 130 people in Paris on Friday, Nov. 13, is still on the run and his whereabouts are unknown. 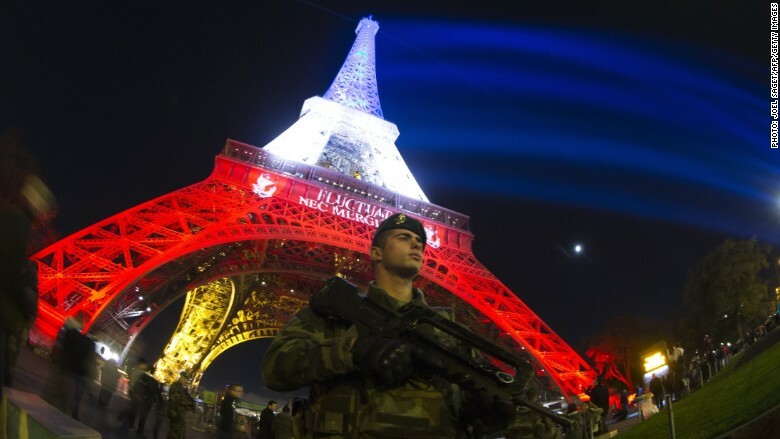 The state of emergency in France has been extended for three months and authorities have upped the already high security measures on the streets and in public buildings. The wave of cancellations comes at a tough time for Paris. Even before the attacks, winter holiday bookings were down 2% compared to last year. Travel had declined after the Charlie Hebdo massacre massacre in January, and it took around four months for the number of visitors to return to normal, the Paris Tourism Office said. This time, the slump is a lot more dramatic. French Economy Minister Emmanuel Macron said Paris hotels suffered a 15% to 20% slump in the number of guests, while restaurants attendance dropped 10%. Many tourist attractions including the Eiffel Tower and Disneyland Paris were closed for several days in the immediate aftermath of the attacks. Planned events and public gatherings have been canceled. Bands U2 and Foo Fighters have postponed their concerts. Tourism is the number one industry in Paris -- it brought in over 21 billion euros in revenue from the nearly 46 million tourists that visited last year. Around 500,000 jobs in the greater Paris rely on the industry. Some countries issued travel warnings to their citizens in the aftermath of the attacks. The U.S. state department has issued a worldwide travel warning. The U.K. government has recommended that British schools planning trips to France avoid the Paris region until Sunday. Foreign offices in Canada, Australia and other countries said tourists should be on high alert when traveling. Related: Will state of emergency crash France's ailing economy? CNN's Saskya Vandoorne contributed to this report.